The Church is featured on the "Explore Churches" web page published by the National Churches Trust. ExploreChurches is the perfect place to discover a love for churches and to find out all the information you need to visit them. To visit their web page just click here. A Said Holy Communion Service is held at 8.30 am. on the 1st. Sunday of every odd month. (ie: Jan, March, May, July, Sept & November) and occasional services at other times. Set in a lovely rural location with deep roots in agriculture the church and village celebrate the importance the seasons and farming play in our lives with ‘alternative’ services (which nearly always involve food!) held regularly throughout the year to mark important events such as lambing, rogation, lammas and harvest - and a pets service too. Please check on the Calendar. The Church is also used for Weddings, Baptisms & Funerals and at Christmas. FEB 2019 . WORK IS NOW STARTING ON THE ROOF AND THE CHURCH WILL BE CLOSED THROUGH THIS BUILDING PERIOD. 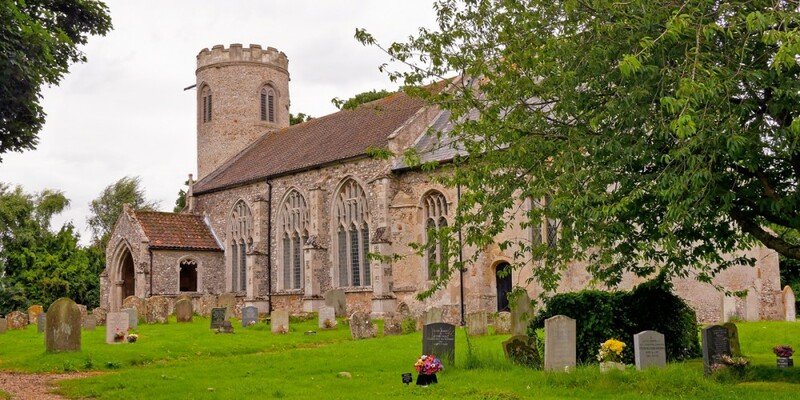 The work is funded by the Heritage Lottery Fund, The National Churches Trust and further support from The Norfolk Churches Trust, The Round Tower Society and The Geoffrey Watling Charity. We are grateful for all their help. As the work reaches completion an exciting weekend of events is planned for 29th/30th of June to celebrate this historic Church. More details to follow soon. East Walton is a small village (Pop: 85 approx, 32 dwellings) in West Norfolk, about 10 miles east of Kings Lynn, one of three villages within the West Acre Estate. St Mary’s Church is mostly medieval, but a wall and a window could be Late Saxon. 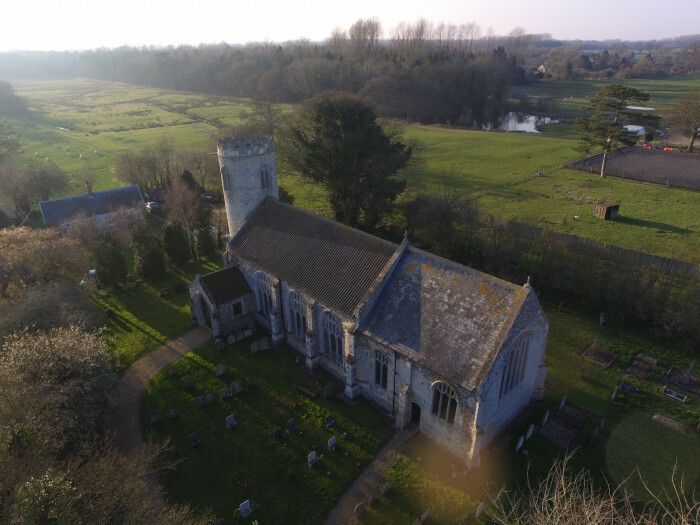 The round tower dates to the late 12th century, the church was remodelled in the 15th century, the interior was redesigned during the 18th century and restoration work was undertaken in the 19th century. To the north are the ruins of the medieval St Andrew’s Chapel It probably went out of use during the 16th century. In the 18th century it was used as a mill house and was ruined by 1845. The base of a medieval cross stands in the west doorway.This substantial ruin of the Chapel of St Andrew, which belonged to the Priory at West Acre, now sits in the grounds of a private house. St Mary's is ancient but the interior is almost entirely of the early 18th century & windows are filled with lovely irregular panes of 18th century glass. The brick floors are a setting for good quality box pews, which lead the eye to a three-decker pulpit in the south-east corner. The chancel arch was filled in and a wooden archway was put in its place, and low, flat ceilings were installed. Perhaps it was just to try to keep the heat in. 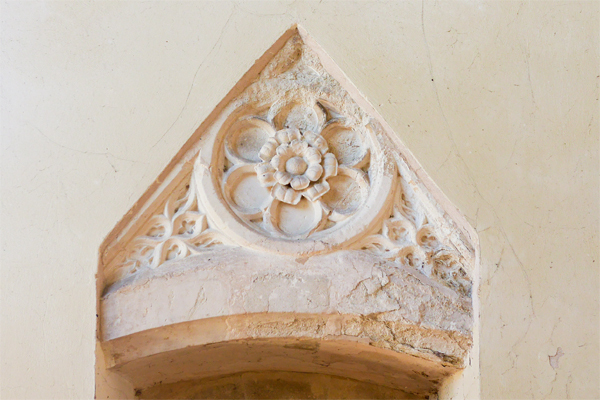 A few medieval touches remain - corbel heads, the quatrefoiled font, the flowered tympanum above the priest door in the chancel. 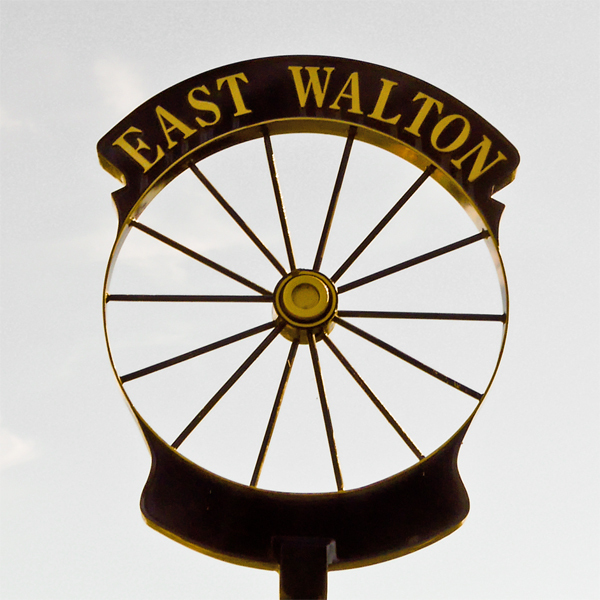 No introduction to East Walton would be complete without mention of East Walton Common and its "Pingos". A 'pingo', a periglacial feature from the Ice Age, is created by the repeated cycle of freezing and thawing, creating shallow water pools. A walk across the common will reveal this odd landscape of various shallow pools and depressions. More up to date, the village also boasts a thriving Montessori school , established over 25 years, and run by teachers and assistants living in the village. The Church and Abbey Ruins seen from the South. Photo courtesy and © John Fielding.